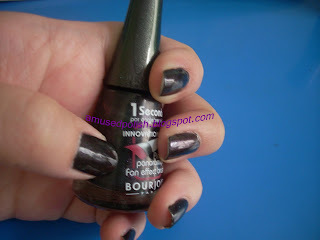 Today I want to show you one of my previous NOTD comparison: Bourjois No. 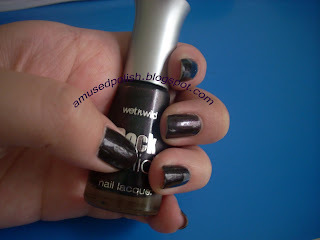 24 and Wet'n' Wild Rock Solid in Dream Black Metallic. Both are green-turquoise- duo chromes. The Wet'n'Wild one is a bit darker than Bourjois and cheaper( 4€ for W'n'W& 10€ for the Bourjois one) and so the Duo-chrome effect isn't as visible/"strong" as the Bourjois one. The brush of the W'n'W one was ok- nothing extraordinary but I have to say I'm completly in love with the Bourjois brush. 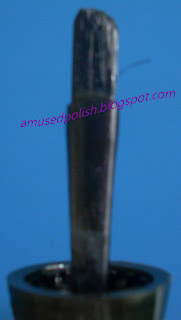 it is really a wide brush (even wider than the Opi pro wide brush) and fans out perfectly. I believe when I took the pics the sun (as always) wasn't shining. All the pics are with two coats, a base and a top coat. 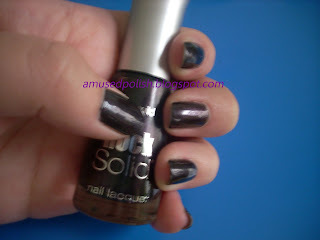 I must admit I prefer WNW polishes over the Bourjois ones. They chip less and I don't like bigger brushes ala Bourjois since they don't allow for precise application (at least for my technique).